The Chicago Bears are an American football franchise based in Chicago, Illinois. They are members of the National Football Conference (NFC) North division in the National Football League (NFL). They participated in the first ever NFL draft in 1936 and selected Joe Stydahar, a tackle from the West Virginia University. Stydahar went to have a stellar career with the franchise and is inducted in the Pro Football Hall of Fame. The team's most recent first round selection (2015) was Leonard Floyd, a defensive tackle from Georgia. The Bears have not had first round selections a total of six times, most recently in 2010 draft. The Bears have only selected the number one overall pick in the draft twice, choosing Tom Harmon in 1941 and Bob Fenimore in 1947. The team's six selections from the University of Texas are the most chosen by the Bears from one program. Nine of the first round selections have been inducted into the Pro Football Hall of Fame. Joe Stydahar was the Bears' first ever first round pick in 1936. Brian Urlacher was selected by the Bears in 2000 in the first round. 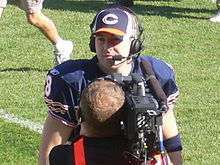 Rex Grossman is the most recent quarterback selected in the first round by the Bears in 2003. Cedric Benson was selected in 2004 by the team with the 4th overall pick. 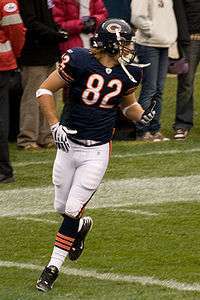 Greg Olsen was the Bears first round pick in 2007. Gabe Carimi was selected in the first round in 2011.
a Luckman was initially drafted by Pittsburgh Pirates but immediately traded to Bears. Prior to the 1938 season, the Chicago Bears made a trade with the Pittsburgh Pirates. In this trade, Chicago took over the contract of end Ed Manske and Pittsburgh sent the rights to their pick (Luckman) in exchange. b Pick acquired from the Philadelphia Eagles. c Pick acquired from the Pittsburgh Steelers. d Pick was a lottery bonus pick. e Pick acquired from Detroit through Pittsburgh. f Acquired from New York Bulldogs. g Acquired from the Baltimore Colts. h Acquired from the Baltimore Colts. i Pick acquired from Pittsburgh Steelers. j Pick acquired from Pittsburgh Steelers. k Pick acquired from Washington Redskins. l Second overall selection traded to Green Bay Packers (who selected Mike McCoy) for Bob Hyland, Elijah Pitts, Lee Roy Caffey. m Pick acquired from New York Giants. n Acquired from Washington Redskins through Los Angeles Rams. o Pick acquired from Green Bay through Los Angeles Rams and Detroit Lions. Bears, in exchange, sent 1976 10th overall pick (James Hunter) and 68th overall pick (Russ Bolinger) to Lions. p Bears traded 1978 20th overall pick (eventually Elvis Peacock) to Cleveland Browns for Mike Phipps. q Bears traded Wally Chambers to Tampa Bay Buccaneers for this pick and Bobby Moore (player named later). r Pick acquired from Tampa Bay Buccaneers. Bears traded 1982 second round selection (32nd overall Booker Reese) to Tampa Bay for a 1983 first round selection (18th overall Willie Gault). s Bears acquired 1988 27th overall pick (Wendell Davis) and 1989's 12th selection (Trace Armstrong) from the Washington Redskins as compensation for Washington signing free agent Wilbur Marshall. t Bears traded 1997 first round selection (11th overall) to the Seattle Seahawks for Rick Mirer. u Bears traded 1999 first round pick (7th overall) to the Washington Redskins for their 1999 first round pick (12th overall), 1999 third round pick (71 overall), 1999 fourth round pick (106 overall), 1999 fifth round pick (144 overall), and 2000 third round pick (87 overall). 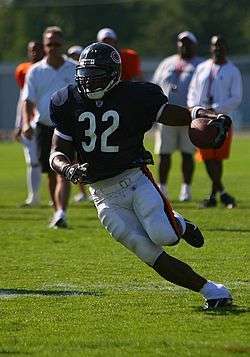 v Bears traded their 2003 first round selection (4 overall) to the New York Jets for 2 2003 first round selections (13 and 22 overall) and 2003 fourth round pick (116 overall). The Bears then traded 2003 13th overall pick to the New England Patriots for 2003 14th overall pick and a 2003 sixth round pick (193 overall). w Bears traded 2006 first round pick (26 overall) to Buffalo Bills for 2006 second round pick (42 overall), and 2006 third round pick (73 overall). x Bears traded Kyle Orton, first round picks in 2009 (18th overall) and 2010 (11 overall), and 2009 3rd round pick (84 overall) to the Denver Broncos for Jay Cutler and a 2009 fifth round pick (140 overall) which was used by the Bears to select Johnny Knox. "Chicago Bears NFL Draft History". Retrieved 2009-04-23. "Chicago Bears 1st Round Draft History". Retrieved 2009-04-23. ↑ Alder, James. "NFL Draft Basics:Determining Order of Selection". About.com. Retrieved April 23, 2009. ↑ "Hall of Famers by Franchise". Pro Football Hall of Fame official Web site. Archived from the original on 2007-04-19. Retrieved 2007-04-27. ↑ "Max Baumgardner". Retrieved 2009-04-24. ↑ "1949 Chicago Bears Draft". Retrieved 2009-04-24. ↑ "Bob Williams". Retrieved 2009-04-24. ↑ "Gene Schroeder". Retrieved 2009-04-24. 1 2 3 "Billy Anderson". Retrieved 2009-04-24. ↑ "Howie Weiss Goes to Lions: Eight of 10 Seniors at University of Pittsburgh Are Snapped Up by Pro Clubs at Annual Meeting in N.Y.". The Milwaukee Journal. 10 December 1938. p. 5. Retrieved 23 May 2010. ↑ "Eagles Earn Right to Deal With O'Brien: Johnny Wysocki Given To Bears in Draft of College Stars". Reading Eagle. 10 December 1938. p. 9. Retrieved 23 May 2010. 1 2 "Pro Football Draft History: 1941". Retrieved 2009-05-03. ↑ "Pro Football Draft History: 1947". Retrieved 2009-05-03. ↑ "Pro Football Draft History: 1948". Retrieved 2009-05-01. ↑ "Pro Football Draft History: 1950". Retrieved 2009-05-01. 1 2 "Pro Football Draft History: 1951". Retrieved 2009-05-01. ↑ "Pro Football Draft History: 1963". Retrieved 2009-07-08. 1 2 "Pro Football Draft History: 1965". Retrieved 2009-07-08. ↑ "Packers Significant Trades, 1957-2008". Packers.com. 2009-01-29. Archived from the original on March 16, 2009. Retrieved 2009-07-08. ↑ "Pro Football Draft History: 1972". Retrieved 2009-07-08. ↑ "Pro Football Draft History: 1974". Retrieved 2009-07-08. ↑ Martz, Ron (1978-04-15). "Bay Bucs sign Chambers but give up Moore". St. Petersburg Times. pp. 99 of 127. Retrieved 2009-07-08. ↑ "Say It Ain't So: Tampa Bay Buccaneers". CNNSI.com. 2001. Retrieved 2009-07-09. ↑ Zimmerman, Paul (1988-03-28). "Getting Free For A Big Gain". sportsillustrated.com. Retrieved 2009-07-09. ↑ "Say It Ain't So: Chicago Bears". CNNSI.com. 2001. Retrieved 2009-07-09. ↑ "Jets trade two picks to Bears for fourth overall". AP. 2003-04-25. Retrieved 2009-07-10. ↑ LeGere, Bob (2006-04-30). "Safety 1st for Bears Trade down to get Manning with draft's 42nd overall pick". Daily Herald. Retrieved 2009-07-10.